Sometimes while I’m designing, I like to escape by listening to music. It often helps to saturate my spirit in a place, a feeling and a rhythm that lifts off into free-flowing creative exploration. Have you ever thought about music as color? Some tunes can be bright, bold and jazzy others can be soft, pastel and sweet. How about listening to music and seeing shapes? Jagged lines or fluid swirls, dots or diamonds? Calypso batiks grew out of this exercise after I popped in a Caribbean island instrumental CD and was unexpectedly swept away! 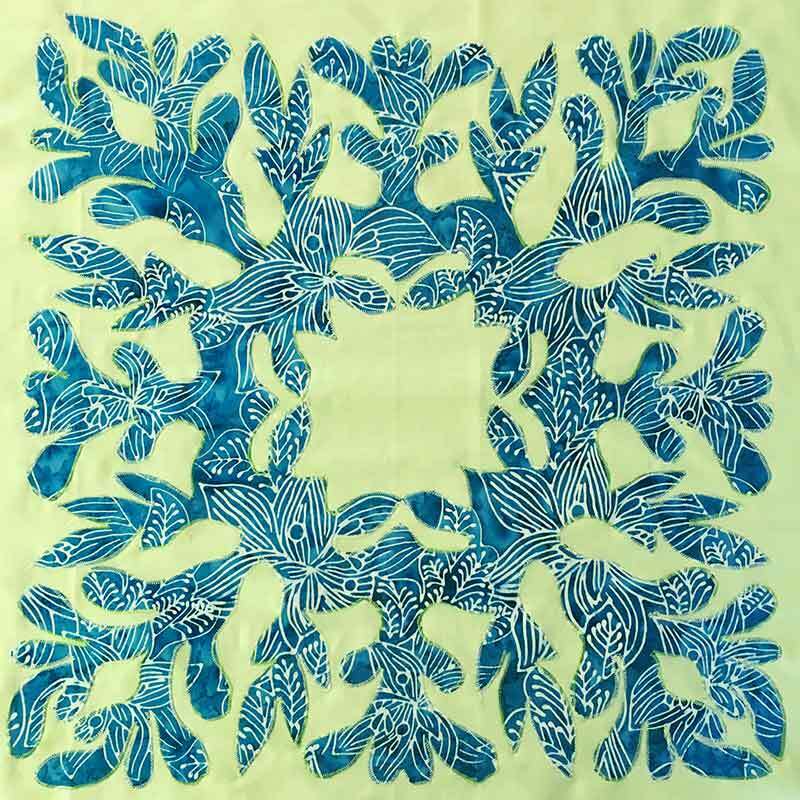 Calypso batiks combine cool blues, tropical greens and vibrant punchy colors that combine to create a collection of harmonic tones that will coordinate beautifully with both Longitude and Latitude, my previous batik collections. Bright hand-drawn hibiscus blooms and florals, percussive geometrics and swirling melodic breezes bring visual music and dimension to this collection. 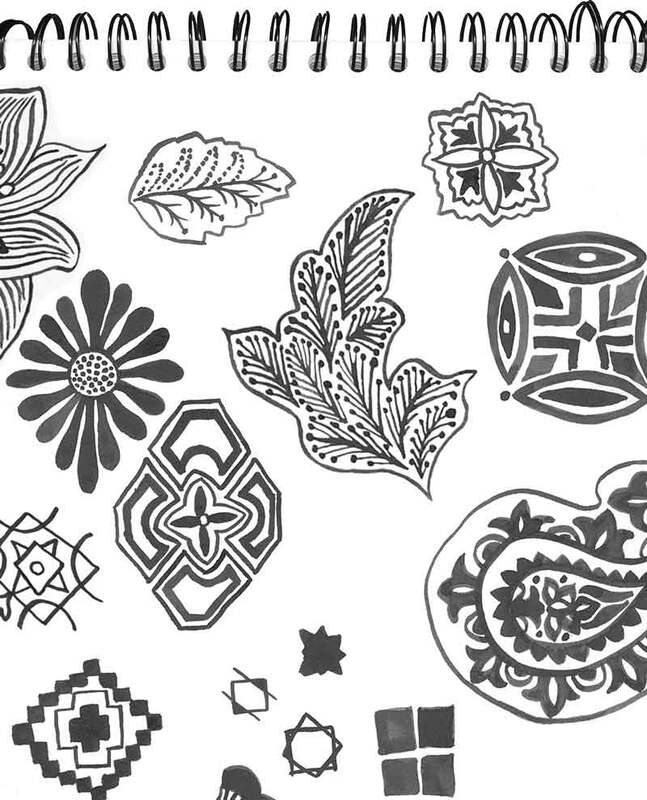 Here‘s a page from my sketchbook where you can a few of the motifs that I played with to create several of the patterns. Twelve prints are offered in exceptionally soft rayon that has a light, flowing and beautiful drape. 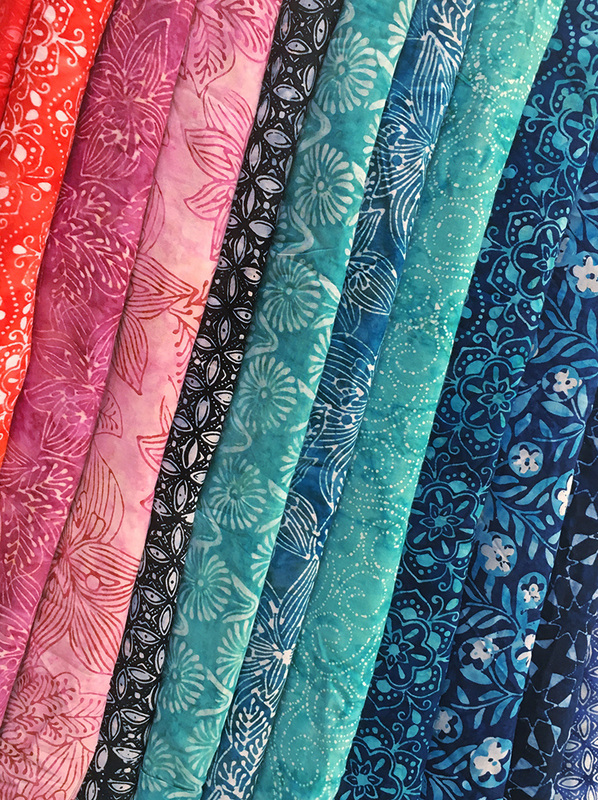 It’s the perfect fabric for sewing apparel – from sarongs and tunics, to shift dresses and skirts, or anything under the sun! 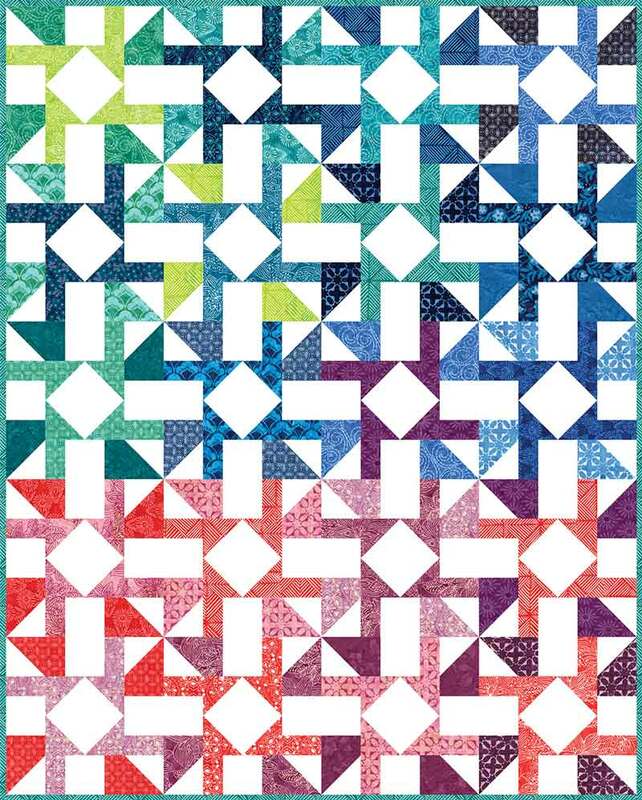 I designed one quilt pattern to go along with Calypso batiks. It’s called, you guessed it, Calypso! When I hit on this design, I felt it captured the rhythm and sound of steel drums and the overall energy of the collection. This quilt is made using a Fat Eighth Bundle plus background fabric and finishes at 56” x 70”. 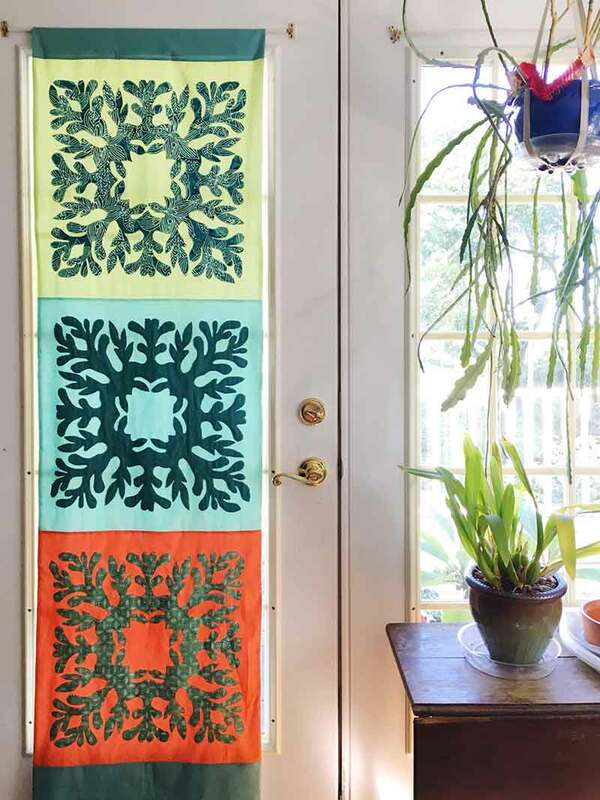 I made a total of three blocks and sewed them together to make a window curtain panel. Calypso batiks. 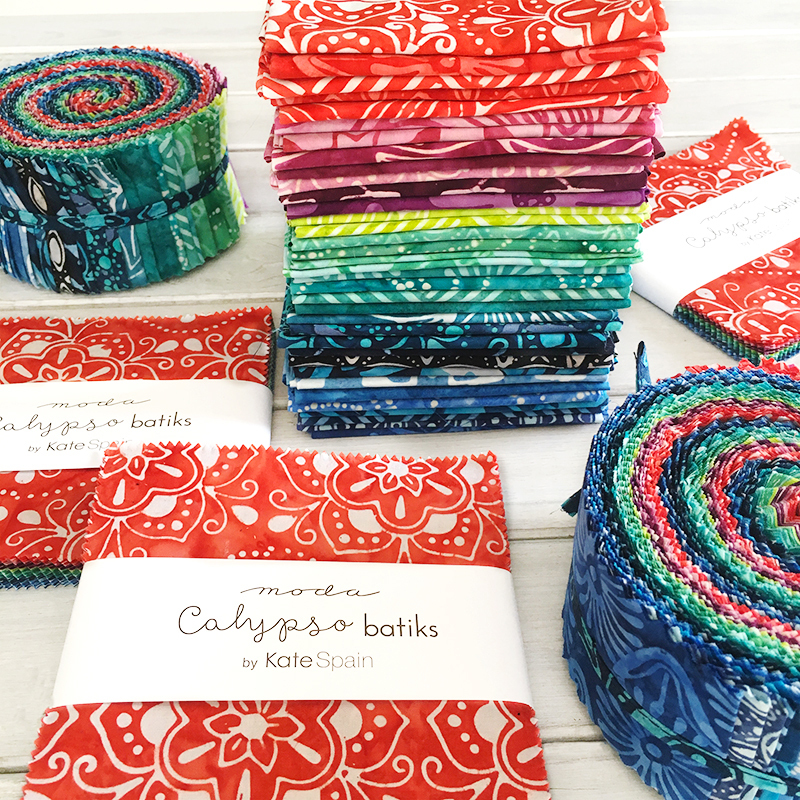 To see the entire collection of woven cottons and rayons – Calypso Batiks PDF. If your winters are anything like ours, that’s the perfect time of year for a tropical getaway. And the best part? It’s on me! Enjoy. Previous Previous post: Let’s get Cheeky! Wow Wow WOW Kate hit it out of the park again! and I just love that all of her Batiks play so well together. Absolutely gorgeous! Can’t wait to get these to brighten up a cold winter! Beautiful! Love the designs and colors! Wow! 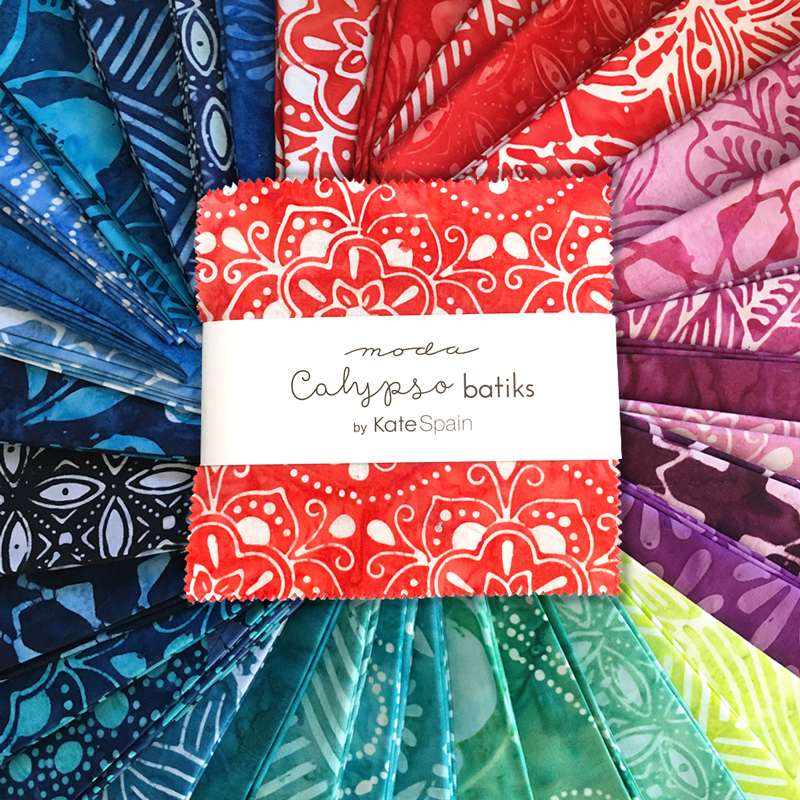 I love everything about Calypso! I love the curtain panel. These are just beautiful! You have done it again! Great fabrics, I love them.